We don't know what is exactly going on with Vicente Lebron's case even though he's been in custody for about 2 months after Homeland Security took him at Logan when Either/Orchestra was returning from an overseas tour. 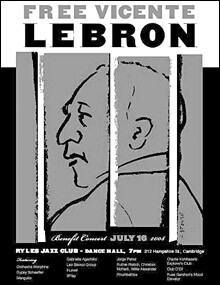 I read some conjecture that Lebron may have had a minor drug conviction on his record from a long time ago, and he's apparently not a citizen even though he's lived here for 38 years. This seems to be one a case when new "security" laws have ensnared a harmless musician. Are we making anyone safer by imprisoning this beautiful soul? What happens if nothing comes of this? That is, they let him go at the end of this and he returns home (the one he shares with his wife -- where his grandchildren probably visit on the weekends)...? As I read it, the open mic happens at 8pm where anyone can go up for a maximum of 3 minutes. Around 10pm, the Cantab is hosting 4-person teams from Lizard Lounge, Maine, and New Hampshire in anticipation of the National Poetry Slam.